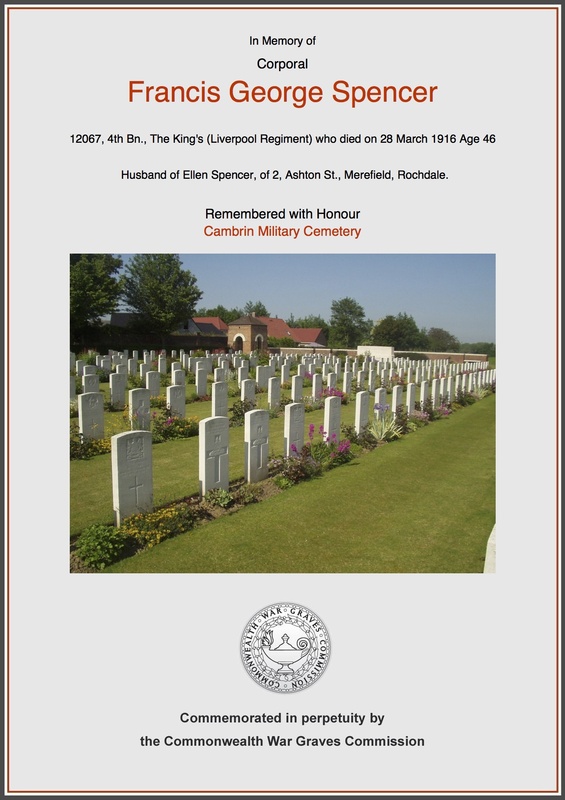 Brother of Samuel Street died 3rd May 1917. 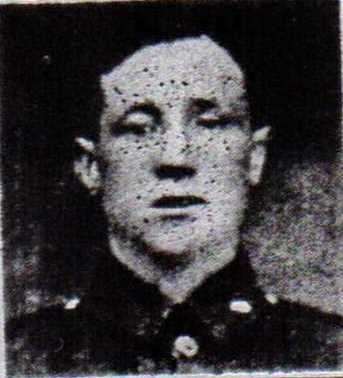 Born: 1895 Burbage Buxton the son of Richard & Louisa Street. 1901 Census: Percy, younger brother Samuel, Mum & Dad were lodging with the Wain family at 4 Hobsons Court. 1911 Census: Living @ 51 Fairfield Road aged 16yrs. 1916 Percy & Samuels father died in the December, at this time Percy parents were unaware that he had been killed 1 month before. On the 27th January 1917 an article in the Buxton Advertiser reported Percy as missing. It must have been a terrible time for Louisa as in May Samuel was killed, she had lost 2 son’s and her husband in around 6 months. Richard & Louisa had no other children. 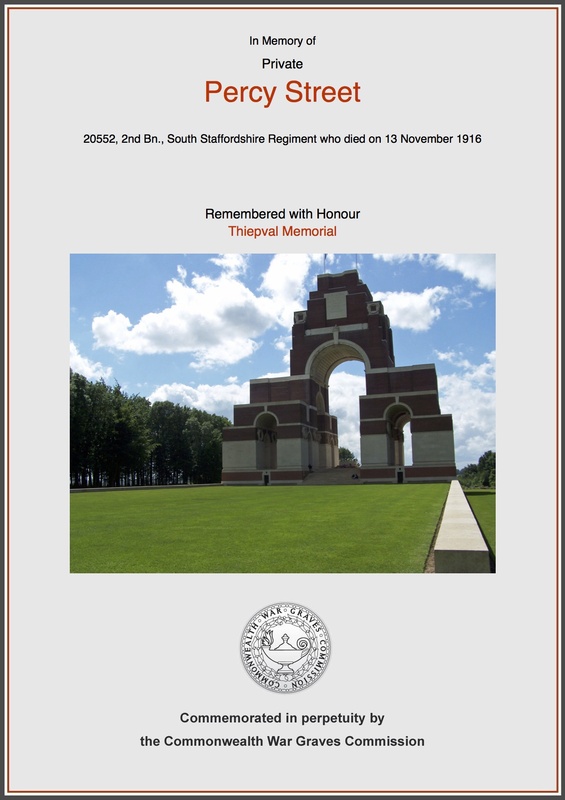 Thiepval Memorial 2014 (Pier & Face 7b). 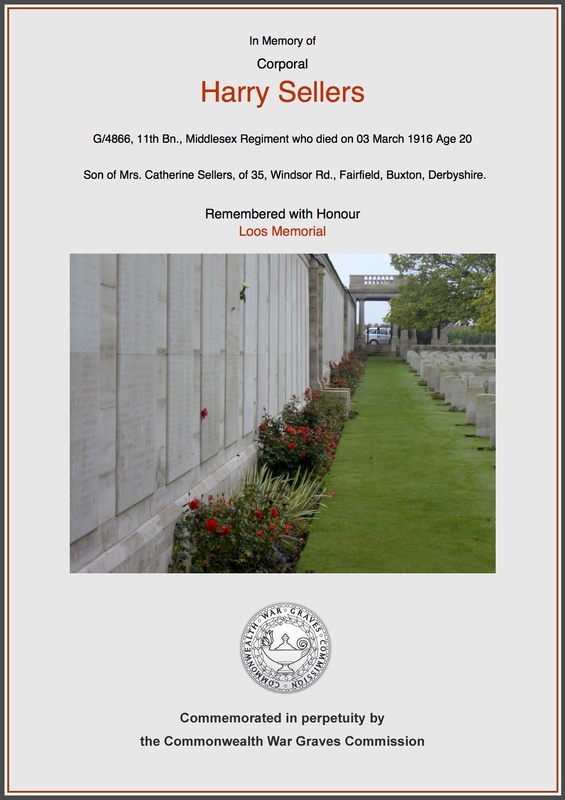 Death of Private E Street, Mrs Street of 13 Victoria Park has been bereaved of her son, Pte. 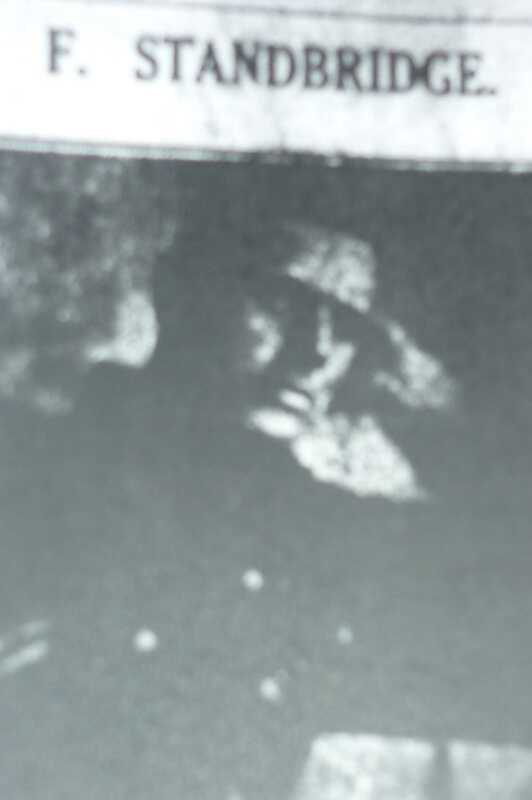 Ernest Street, who has fallen gallantly serving his country in the war. This soldier was interred at the scene of Action. It was gratifying to the bereft mother to be allowed to attend the funeral which was of a very important character. It must have been unusual for a Mother to attend the funeral of her son in France during the war even though it was nearing the end of the war! 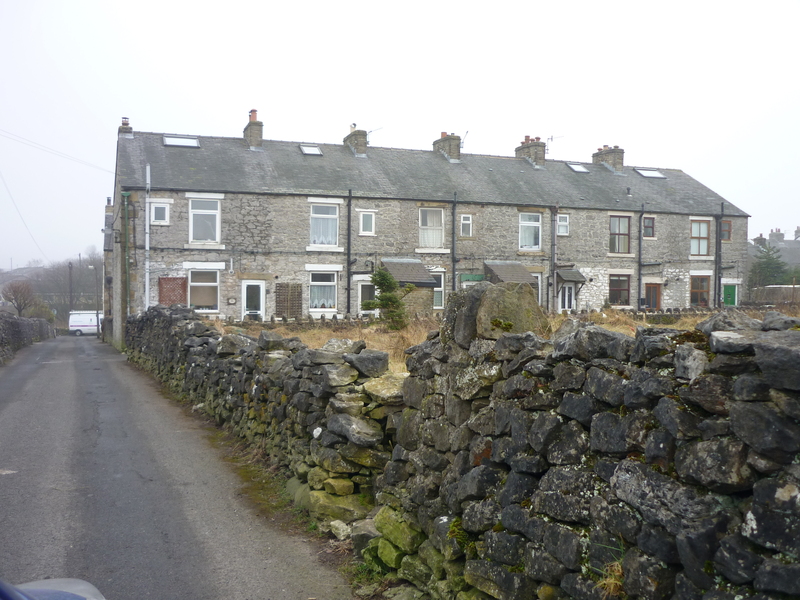 Born: 5th March 1891 Burbage registered Chapel-en-le-Frith Vol 7b Page 826, to parents Joseph & Kezia Street. Ernest had 4 older brothers Joseph, Richard, Harry & Sidney & an older sister Kezia Hannah (who never married and became a Certified Midwife). 1891 Census: Living at 46 Old Road Burbage aged 1mth. A younger brother Ralph was born however in December 1895 the father Joseph died leaving Kezia with 6 boy’s. All the boys attended North Road School. Ernest started school on 15th June 1896. 1901 Census: Living @ 9/10 Midland Terrace, Fairfield Road Aged 10yrs. 1911 Census: Living @ 4 Watson Road, Lowestoft, Sussex. Occupation: Confectioners Assistant/Maker. Ernest’s mother was living at 13 Victoria Park Road and her occupation was ‘Horse Keeper’ at home are Kezia Hannah, Sydney, Ralph & a boarder. 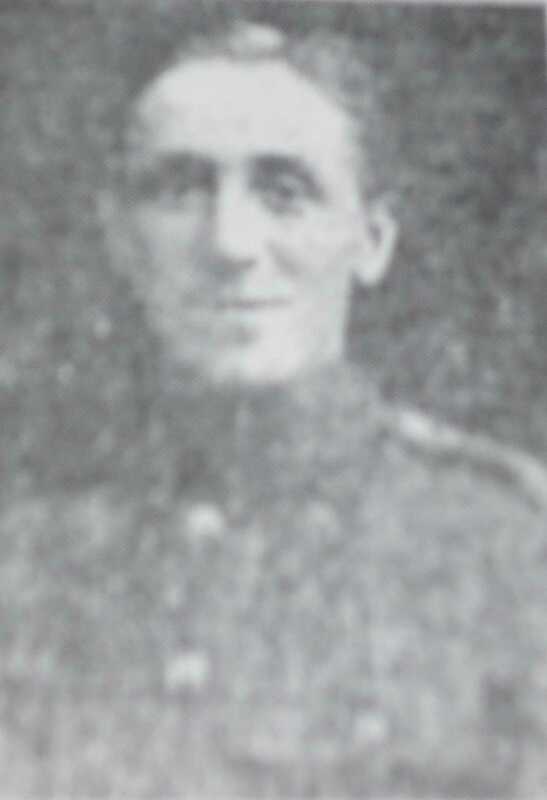 Enlisted: Aldershot living Brixton Surrey & went to France on 17th December 1917, Ernest’s Service papers were destroyed. 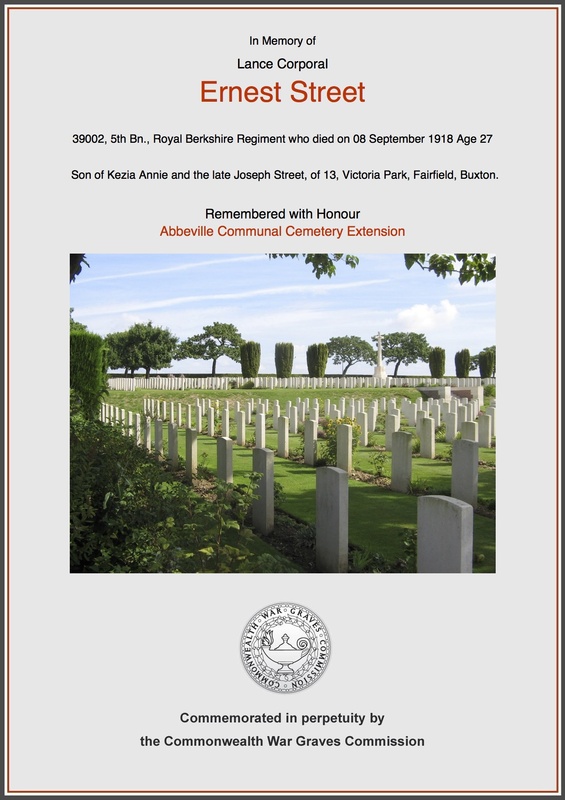 Memorial: Abbeville 1V. 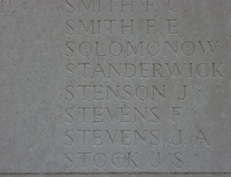 E. 12 (picture added on Find a Grave Memorial 16/4/2013 by JMW). 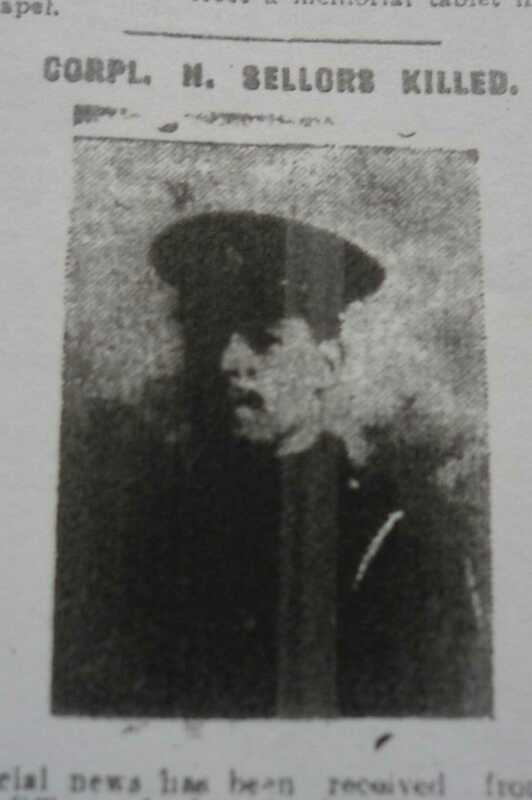 John photograph from High Peak News October 1915. 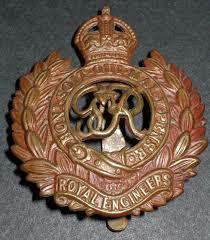 Served as a Private in the Duke of Cambridge’s Own (Middlesex Regiment) 3rd Battalion. 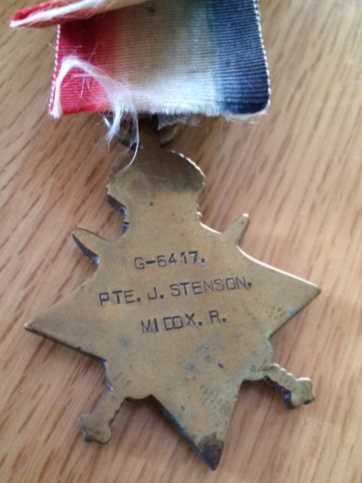 Army service number G/6417. 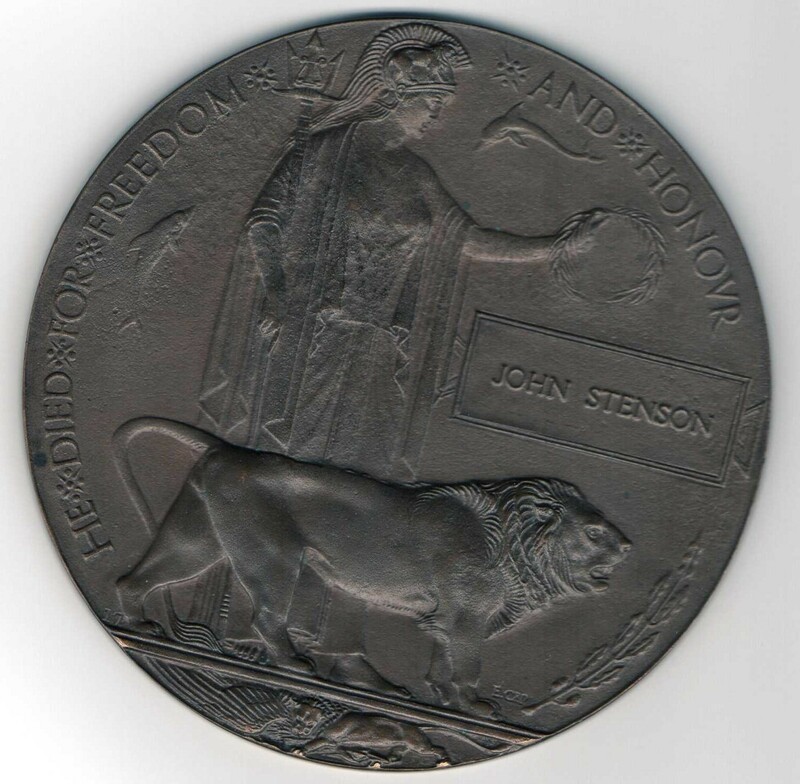 John was involved in one of the most brutal and tragic battles of the war aged just 25yrs. 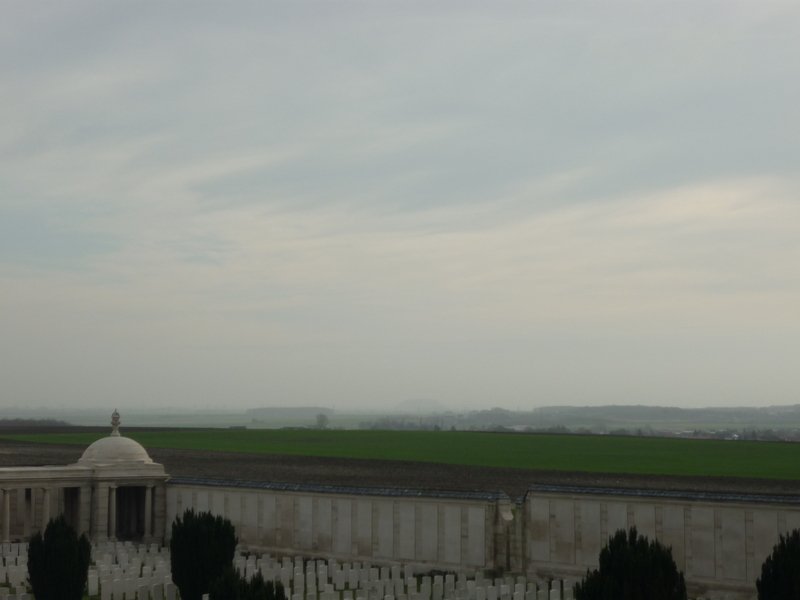 The exact date for John’s death is uncertain, He died either late on the 29th or in the early hours of 30th September.Most of the fighting at Loos, where the land is very flat, was centered on taking Hill 70 which was a German stronghold. Fighting continued throughout the 29th September the battle raged. During the night the enemy attacked causing the loss of a Gun Trench. The Germans also shelled the village from Hill 70 with an 8-inch Gun. 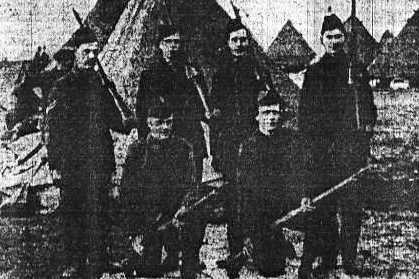 Troops in Loos prepared to withdraw, remaining troops consolidated their positions. Duke of Cambridge 3rd Battalion Middlesex Regiment War Diary report from the National Archives detail events as they happened. 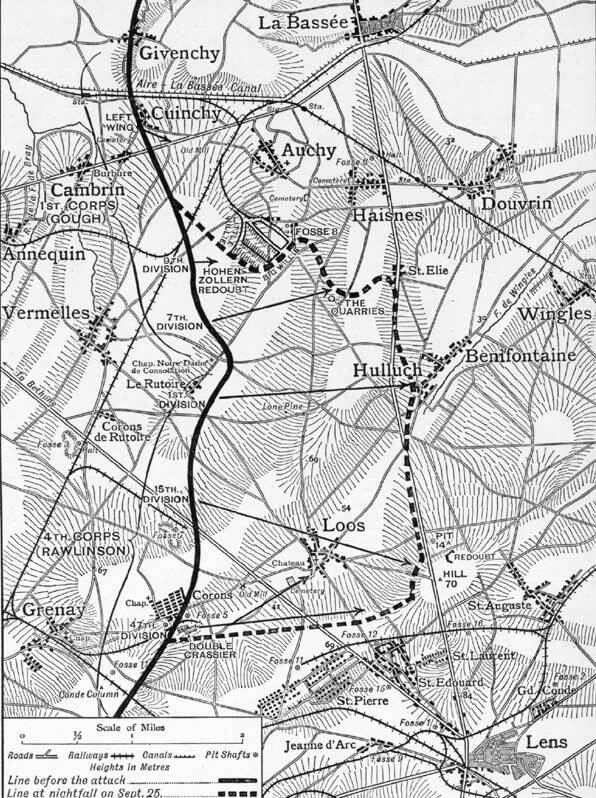 At 2am orders received to proceed to British old first line trench ‘Central Bayou’ to a position opposite Hohenzollern redoubt. On arrival there orders received to support the ‘Buffs’ in an attack at once towards the DUMP and clean all trenches & communication trenches on left of DUMP. Bombardment started & ceased at 9.30am. The Buffs advanced in the open & Battalion along SOUTH FACE TRENCH (ref map 36.C.NW) at arrival at point 35 DUMP TRENCH. The bombers attacked along left face of trench. Considerable progress was made when bombs ran out and urgent appeals were made for more. 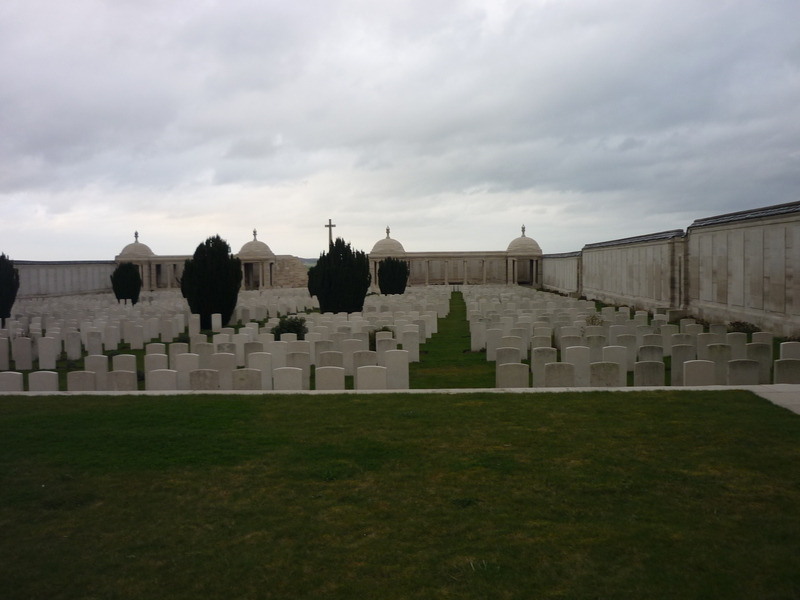 The battalion then began to suffer considerable casualties from a heavy attack with bombs. The narrow trench then became congested with wounded, men of other units who were relieved & on their way out of the trench by the Buffs who had to give away on the right. The CO then gave the order to withdraw slowly, this operation was most difficult the trench being a narrow one and only 7ft deep. We were enfiladed on both sides by MG fire and impossible to show a head above the parapet. About this time the CO (Col. Neale) was killed. The battalion was then withdrawn down the South Face. Orders were received to hold BIG WILLIE. The company was distributed along BIG WILLIE. 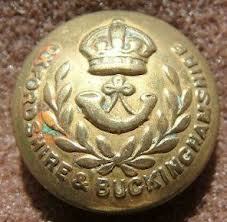 The Royal Fusiliers were ordered to hold S FACE. During the day the Germans heavily attacked the S FACE but were held by our bombers. Residents of Fairfield heard with much regret that Pte. 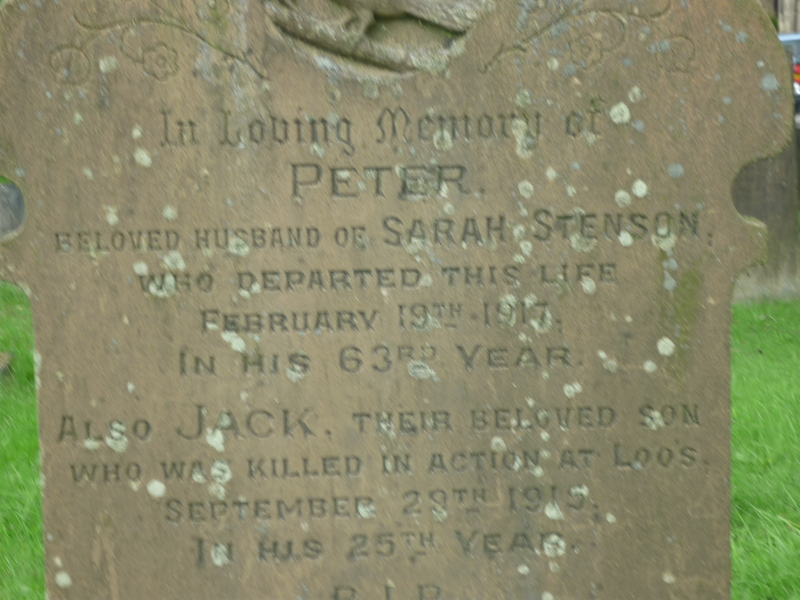 John Stenson, who lived at Heaton Place, Town End, had been killed in action. This soldier fell in the service of his King & country on the 29th September, and the news was received officially on Thursday evening. Previously, however a friend of his had written conveying the sad news, but how John was killed is unknown. He was laid to rest on 2nd October. 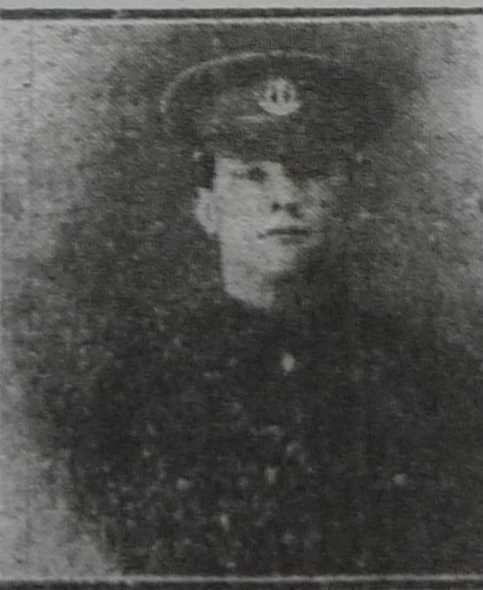 Before enlisting this soldier was engaged by the Buxton Lime Firms Company Ltd, and he was 25yrs of age. 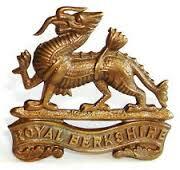 He enlisted in the 3rd Battalion Middlesex Regiment last November. All will unite with us in extending sincerest sympathy to his relatives and friends. Heaton Place the home John left when he went to War. Born: John (Jack) was born on 11th March 1890 to parents Peter & Sarah Stenson (nee Kidd). John was baptised on 14th December 1892. John had an older sister Margaret and an older brothers Peter & Joseph. 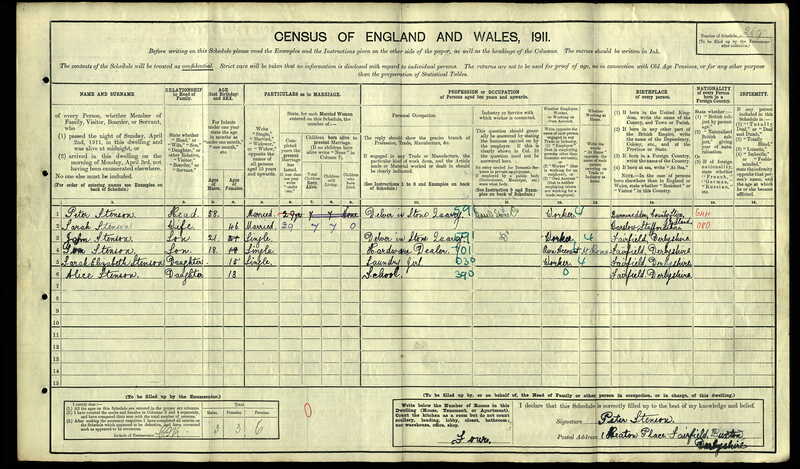 1891 Census: Age 1yr Warslow, Staffordshire (visitor) with his Mother to his Grandparents. The family were living at No 6 Heaton Place, Town End, Fairfield. 1901 Census: Living @ 5 Heaton Row (Place) aged 11yrs @ School & a Golf Caddie at Fairfield Golf Course. A lot of the boy’s acted as Caddies during the late 1800’s & early 1900’s in Fairfield some with permission. John now has younger siblings, brother Tom and sisters Sarah & Alice. 1911 Census: Living @ 1 Heaton Place, Fairfield Age 21yrs. 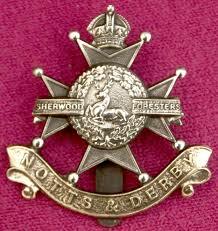 All the Stenson boys served during WW1 Peter in the RAMC, Joseph in Sherwood Forresters, Tom in the Sherwood Forresters later transferring to the Machine Gun Corps from which he was honorably medically discharged and receiving the Silver war Badge. The quarry would have employed a large number of quarrymen with specific tasks. Delvers, who started the process, were skilled in removing stone from the various beds. 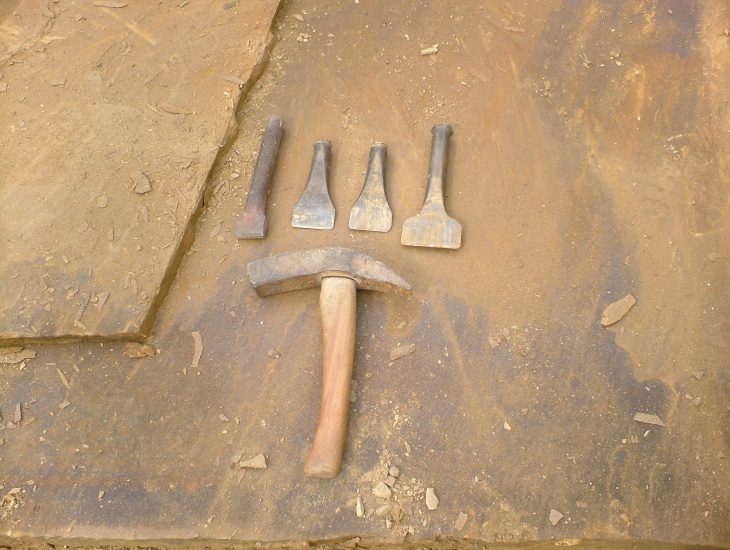 Under their direction labourers used picks, wedges and crowbars in the quarry. Large blocks were split using plugs and feathers. A straight line (or race) of 60cm deep holes was drilled into the rock. 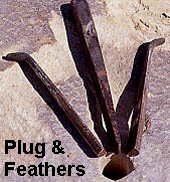 Feathers are metal flanges which fit into the hole, and then a metal wedge (or plug) was gradually knocked into each hole so that the pairs of feathers were widened by a series of mallet blows. The rock then split along the line of tension. This process is still in use today. Frank’s name is on the Memorial. Born: 1889 Leamington registered Warwickshire Vol 6d Page 582. Frank was baptised on 24th April 1889 and was the son of Charles & Agnes Standbridge, Frank had an older sister Muriel Daisy, Charles was a Shoemaker. 1891 Census: living at 24 Villiers Street Leamington aged 2yrs. 1896: Charles died, Frank was only 7 years old. 1901: Frank aged 11yrs is liisted as being in The Royal Orphanage in Wolverhampton. Mother Agnes & Sister Daisy Muriel are lodging at 5 William Street in Leamington Priors, Agnes is working as a Dressmaker. 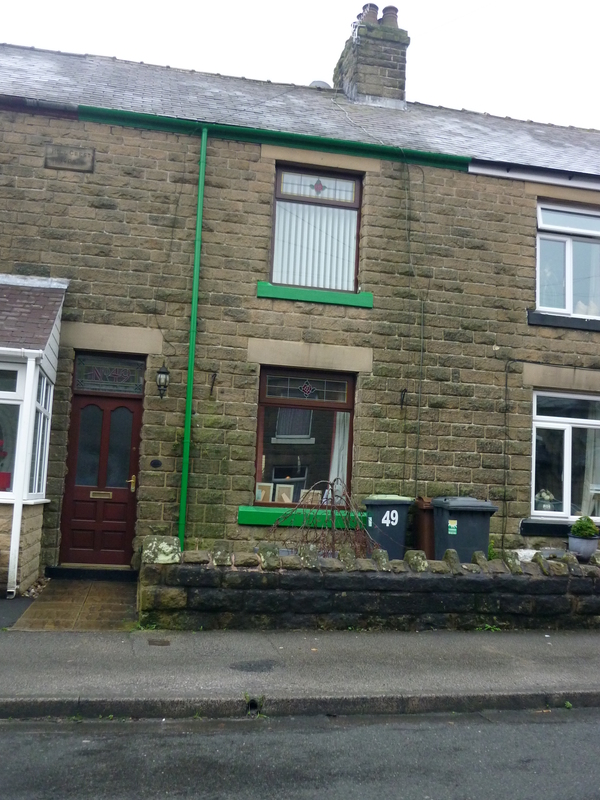 1911 Census: Frank is living @ 23 Park Road, Buxton as a boarder, the home of Mrs Elizabeth Linaker. Occupation: Groom, Frank also worked as a Reporter for the Buxton Advertiser. The photograph was taken at Cowshott Camp, Woking Frank is kneeling down on the right. Frank went to France in July 1915 as shown on his Medal Card. Grave: Plot XXX1. C. 9. 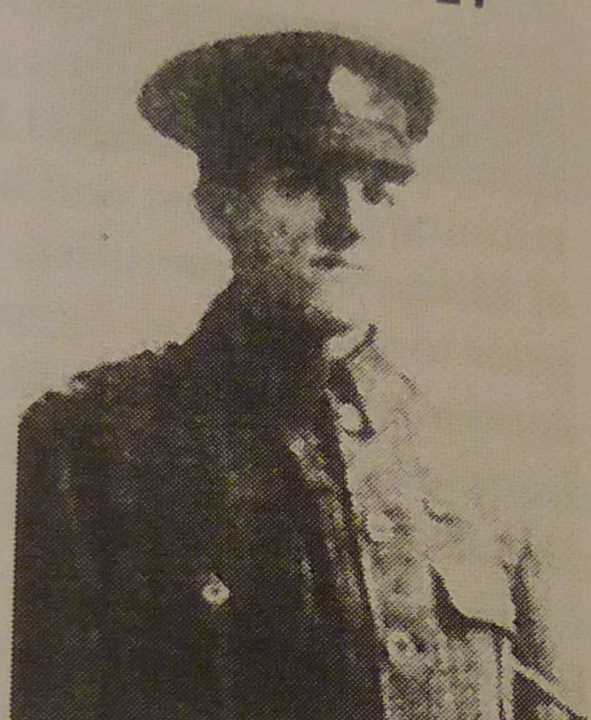 It is with sincere regret we have this week to announce the death in action of Corporal Frank Standbridge, who for several years past had been a member of the reporting staff of the “High Peak News” and “Buxton Advertiser.” He was well known and respected in the district which he visited in the performance of his duties. With his aged mother, who resides at Leamington, and his sister, much sympathy is expressed in their sad bereavement. 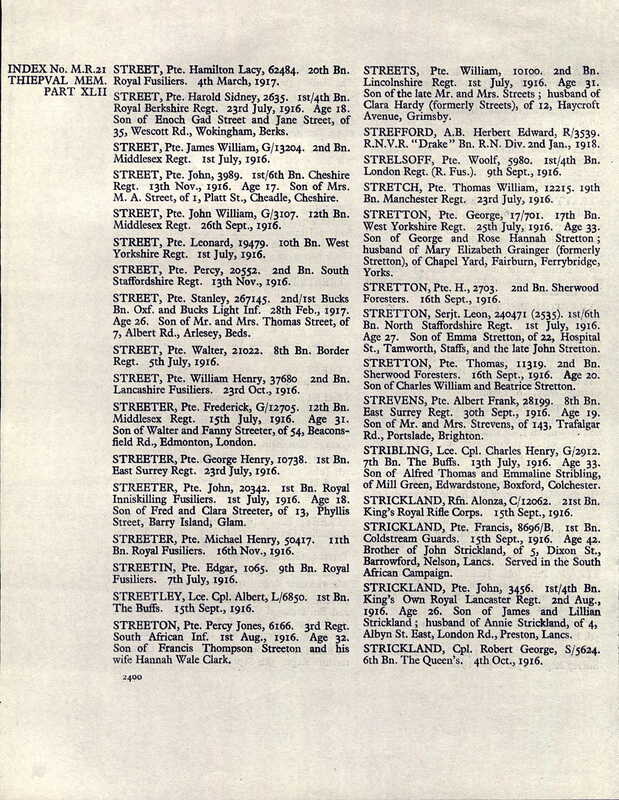 Amongst those by whom the appeal for men in their country’s call was most readily answered was Frank Standbridge, and a very tender chord is touched by the news of his death, received from Coy,-Q,-M,-S, Kennerley, another member of the staff of this journal. 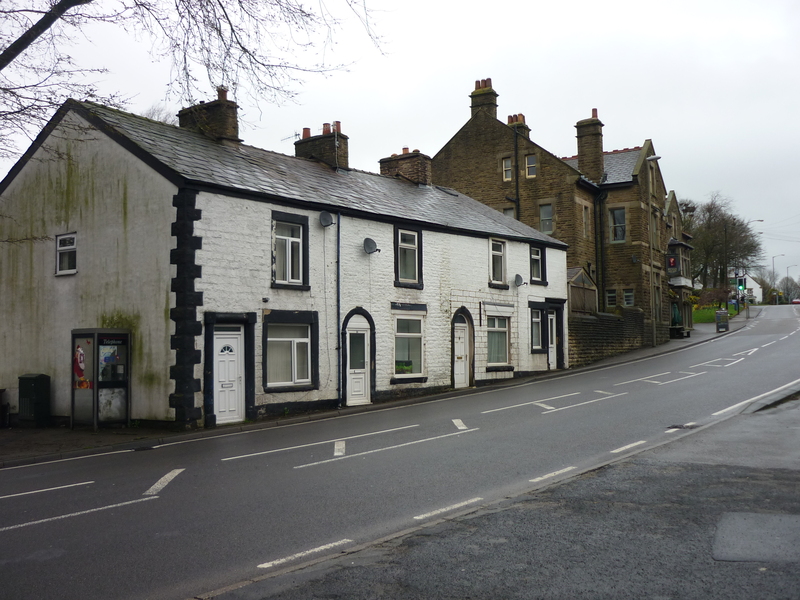 The writer well remembers the day on which Standbridge and William Brunt, a fellow-reporter on the “Buxton Herald” went to the recruiting office and did their duty. Poor Brunt’s death, only a few day’s after he had been promoted to commissioned rank is still green in the memory of us all, and now that his bosom friend, in peace and in war, has given his all, the reflection that two such fine young men who had the world before them, and a world of promise, too, have been so ruthlessly laid low, is grievous indeed. Throughout a big portion of the High Peakland, and in Buxton in particular, was Frank Standbridge personally, intimately known. His profession took him into spheres not open to most men. It is no boast to say he was a young man of remarkable energy and one who never knew what is was to have done enough in the interests of the paper on which he was employed. Physically he was splendidly endowed: be it at football, cricket, swimming or running, Frank Standbridge could always hold his own, and oftentimes a bit more. He possessed above the average abilities of the all-round young athlete, and since joining the Army, has given proof of such long distance races especially. It can easily be understood that the traits in his character that showed them-selves naturally in private life would manifest themselves when playing the sterner game of war. 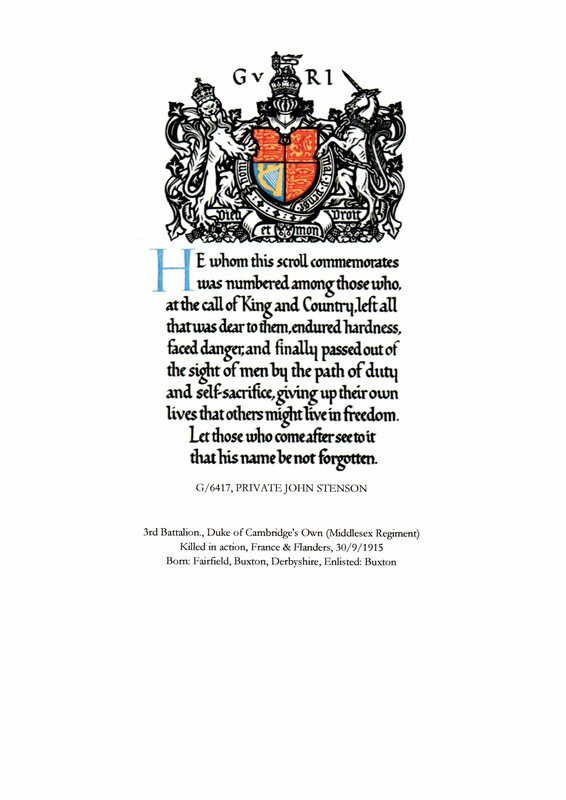 All who knew him, in Derbyshire & Warwickshire, will we think agree when it is said that no young man had better qualifications for the making of a good soldier, and that he did his duty fearlessly, conscientiously, faithfully, in no matter what post he filled, will be taken for-granted. The following letter was received on Wednesday from Company-Quarter Master Sergeant W H Kennerley, of ‘A’ Company:- It is with the deepest regret I write this letter. 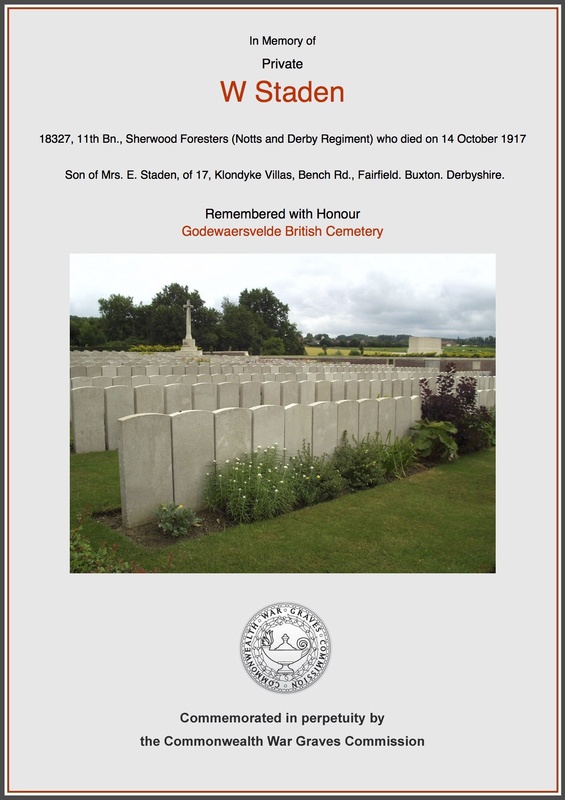 Poor Standbridge died a soldiers death on Thursday afternoon. I have only just had the official intimation. Can you imagine what it is to me to write this, following so closely on Billy Brunt? 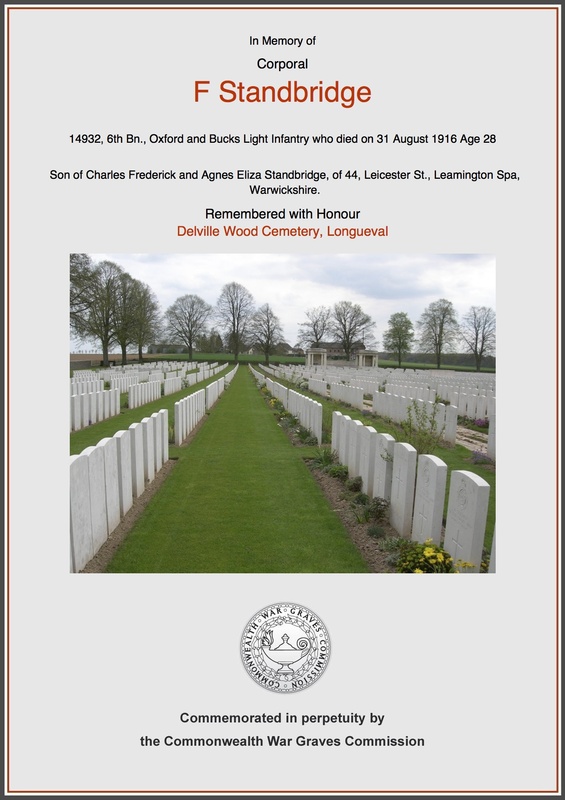 Standbridge was killed in the first line trench at his gun. I was not with him, being with his Trench Mortor Battery, to whom he had been attached now for some four months. He was buried in a cemetery behind the line. I am not allowed to tell you where but i expect the eyes of the world will be on this place tomorrow. A 9.2 shell dropped right into six of them while attending to their gun, killing five and wounding one. It was a great blow to me when I was told, for we had been through the campaign together since we came out until he went to the trench mortars, and then he was attached to our brigade, so I frequently dropped across him. While he was in my platoon I always found him fearless & brave, always ready for any task put to him. Beloved by the boys, he is indeed a great loss. I can’t tell you what a loss he was to me when he left the platoon for the trench mortars. Never shall I forget him at Loos last September. What I should have done without him I don’t know. And now he has gone to his maker gone where there are no such bloody wars as this. If it is any comfort to those who loved him best, let me say he died a noble death and suffered no pain. He will be sadly missed in this Battalion’s sporting circles, for he was the life and soul of “D” Company in all their sports and always gave a helping hand whenever he was asked. I only wish it was in my power to describe him as a Soldier in more eloquent terms. I can only say, “Old Stan, did his bit, and did it well.” The old boys of his old platoon join me in this simple method of sympathy. Although poor Frank has gone, his name and memory will be honoured by all his old comrades in this Battalion. I wish I could write more, but it is so difficult for me. 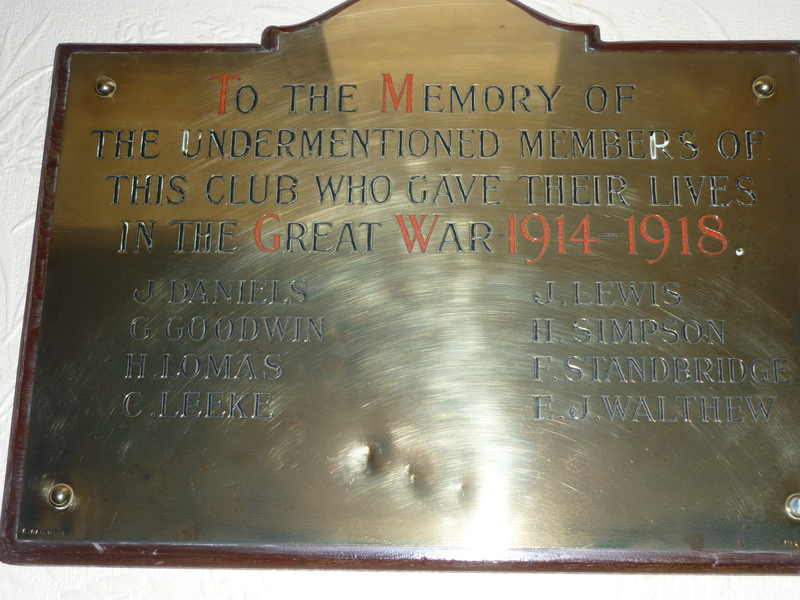 “Greater love hath no man to give up his life for his friends.” Corporal W. D. Sample has written under the date September 1st to Mrs Boundy, of Queens Road, Fairfield where Corporal Standbridge had apartments when in Buxton as follows:- You will be sorry to hear that Corpl. Standbridge was killed in action yesterday noon. The enclosed letter was found in his pay-book as we were burying him. To you who knew him better than the writer, it will be no greater loss than to us. His cheerful disposition his ready wit, his courage, were an example to everyman in the Battery. He died working in his gun emplacement, and died, I’m sure, as cheerfully as he lived. 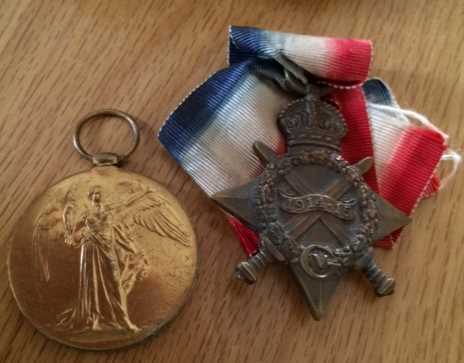 Corporal Frank Standbridge wrote a letter to Mr & Mrs Boundy of Fairfield Road dated 28th June 1916 in which he thanks them knowing how busy they are for writing to him. 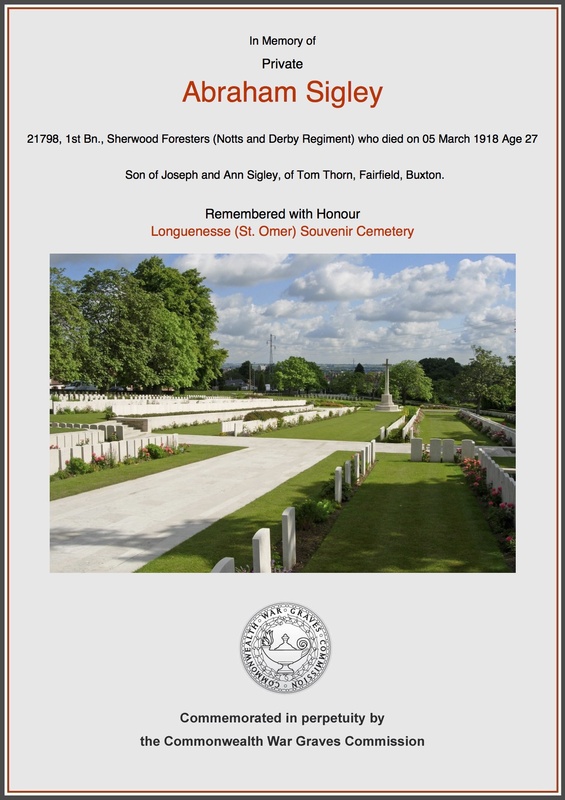 Born: 24th October 1893 Branside, Nr Buxton registered Chapel-en-le-Frith Vol 7b Page 798 O/N/D middle name Lomas, to parents John & Elizabeth Staden. William had 4 older siblings Thomas, Annie, John & Joseph. When William started North Road School on 1st October 1900 his year of birth is recorded as 1894. The family were living at Foxes Yard. 1901 Census: Living at Old School House Fairfield aged 7yrs. 1911 Census: Living with parents @ 49 Kings Road, Fairfield Aged 17yrs. Williams occupation was as a Milk Seller/Deliverer. Thomas, John & Joseph + one other child had died, but there were three younger siblings Edward Reginald, Percy James & Joseph. 1917: Address 17 Klondyke Villas Bench Road Fairfield. http://www.cwgc.org/find-war-dead/casualty/589587/STABLEFORD,%20W%20H I visited the memorial in 2014 but was unable to locate his memorial in this or any of the surrounding Cemetery’s. Driver W H Stableford photograph from Buxton Advertiser July 31st 1915. 1901 Census: Living at 16 Bridge Street aged 10yrs. 1911 Census: Living with parents @ 16 Bridge Street aged 20yrs. 1915: William married Margaret Cooper in Kings Norton, Warwickshire. 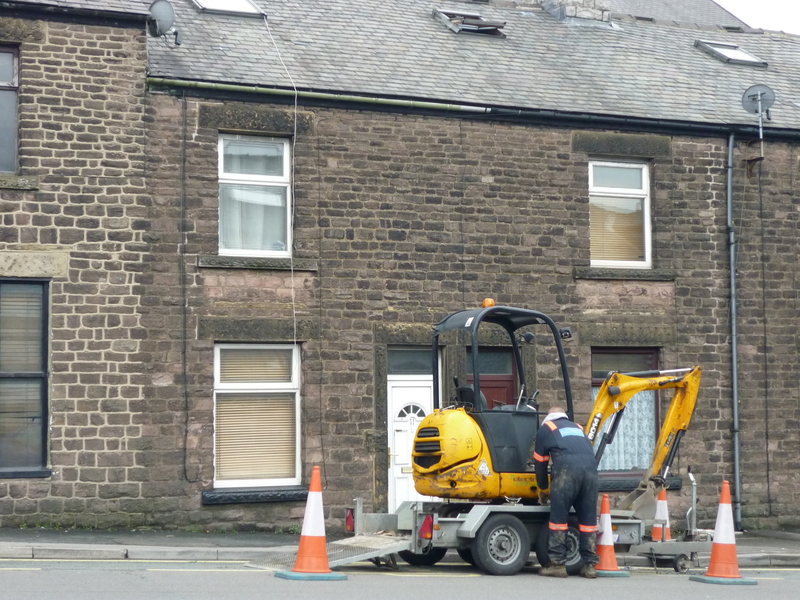 The couple set up home at 9a Terrace Road, Buxton. 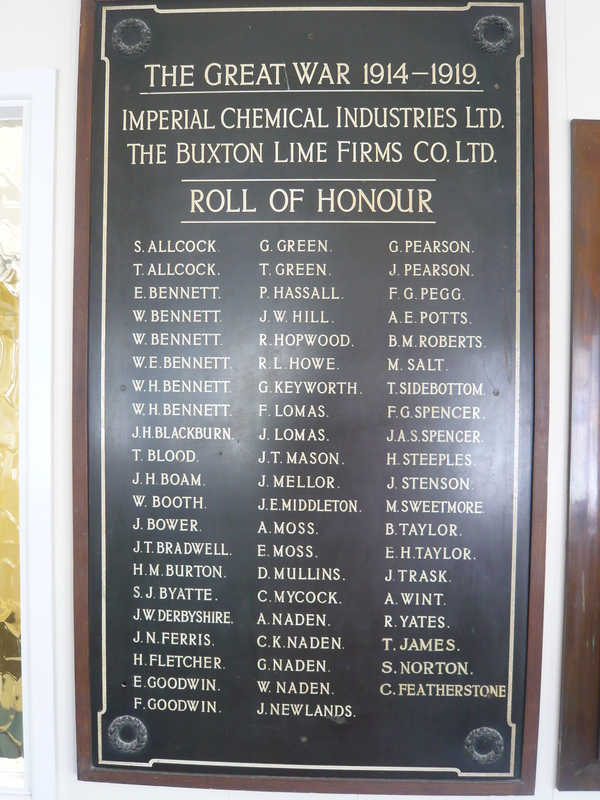 Francis is on the Buxton Lime Industry Memorial as before he went to War he was working at the Quarry in Dove Holes and had done so since he left school apart from his military service during the Boer War. 1871 Census: The family are living at Little Bolehill, Wirksworth. Francis has a baby brother Albert 4 months old. 1881 Census: The family had moved to Harpur Hill and there was another baby brother Joseph. Francis started North Road School 17th April 1882 the family were living in Batham Gate, Francis left school on 29th June 1883 to work in Dove Holes. Marriage: 3rd July 1897 Buxton, Francis married Ellen Wilshaw, at St John’s Church. Francis is not on the 1901 Census, as he was in the Army he would have been in South Africa fighting in The Boer War, with the 1st Battalion, The King’s (Liverpool Regiment). Ellen was living at 1 South View, Fairfield, with their daughter Violet, and her son Frank Wilshaw. Living at the same address was Frank’s widowed father Anthony. 1911 Census: Living 14 Hogshaw Villas with wife and 6 children. Occupation: Stone Quarryman. The couple had five more children, Mabel, Nellie, Ethel, Edward Anthony and Bessie. Memorial: Cambrin Military Cemetery Plot F 33. 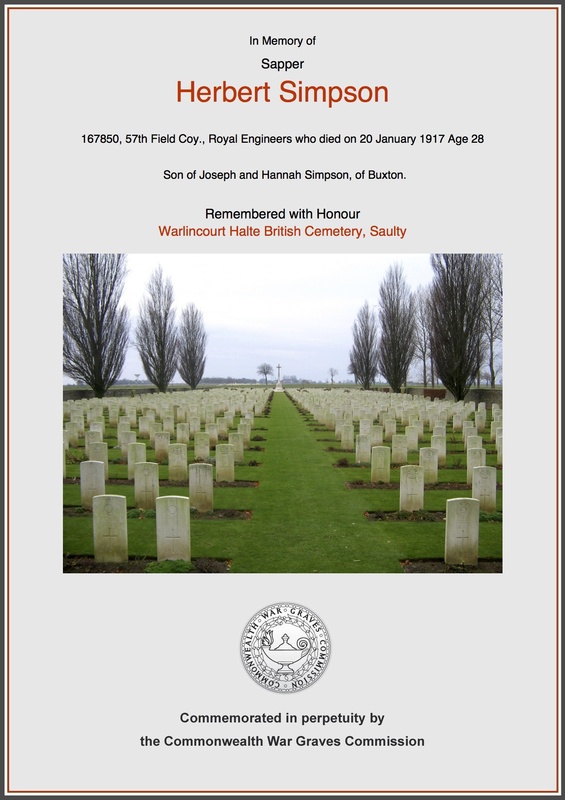 Herbert enlisted at Derby on the 5th February1916 and then transferred to the Royal Engineers, Herbert was sent to France on 13th December 1916 just over a month before he was died. 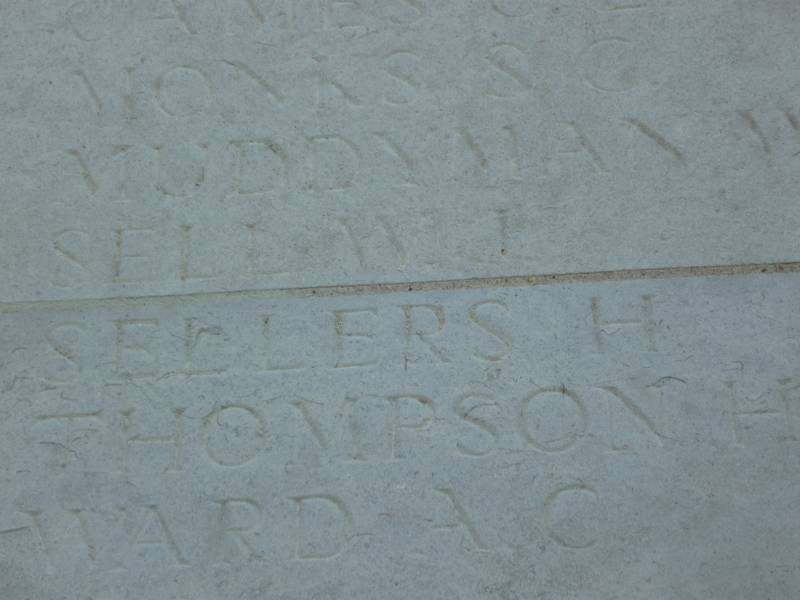 Herbert’s name is on the Memorial. 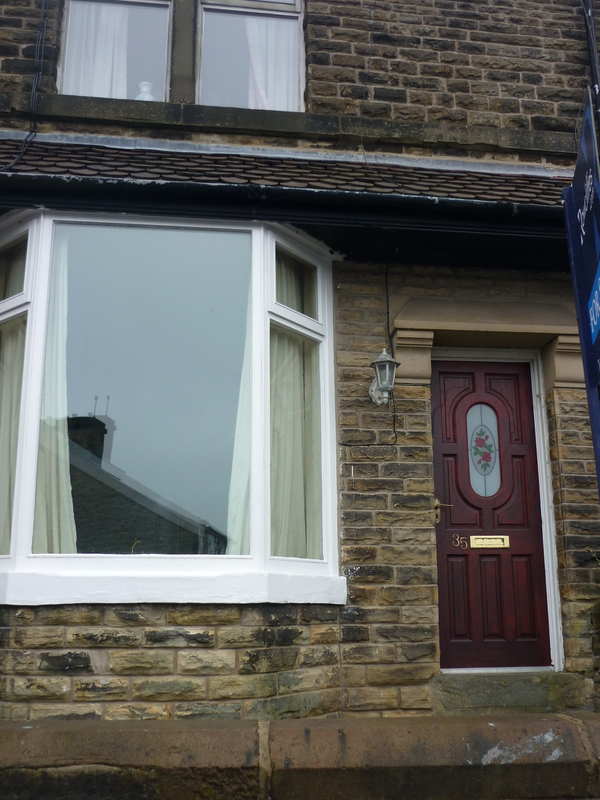 Born: 27th June 1888 at 5 South Street, Buxton parents Joseph and Hannah Simpson. He had four older siblings, James Francis, Martha, Ellen and Elizabeth. On starting school Herbert’s birthday is given as 9th July 1888. 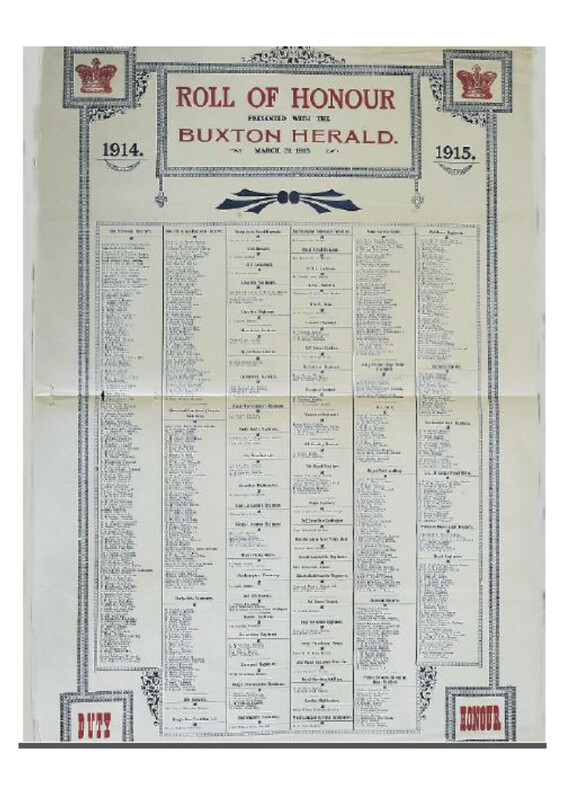 1891 Census: Living with Mum & Dad aged 2yrs @ 5 South Street, Buxton. Herbert now had a younger sister Louise. Herbert started North Road School on 15th January 1894. 1901 Census: Living @ 51 Kings Street, Fairfield. Aged 12yrs with brother James Simpson. 1911 Census: Living @ Bulls Head Cottages, Fairfield Road. Aged 22yrs still with brother James Simpson working as a House Plumber. Service: Formally Pte. 45243. North Staffordshire Reg. 1891 Census: Living with parents @Tom Thorn aged 3yrs. 1895: Abraham started North Road school on 24th September the family were still living at Tom Thorn. 1901 Census: Abraham had 6 younger siblings, James, Moses, George, Mary Ann and Emma. 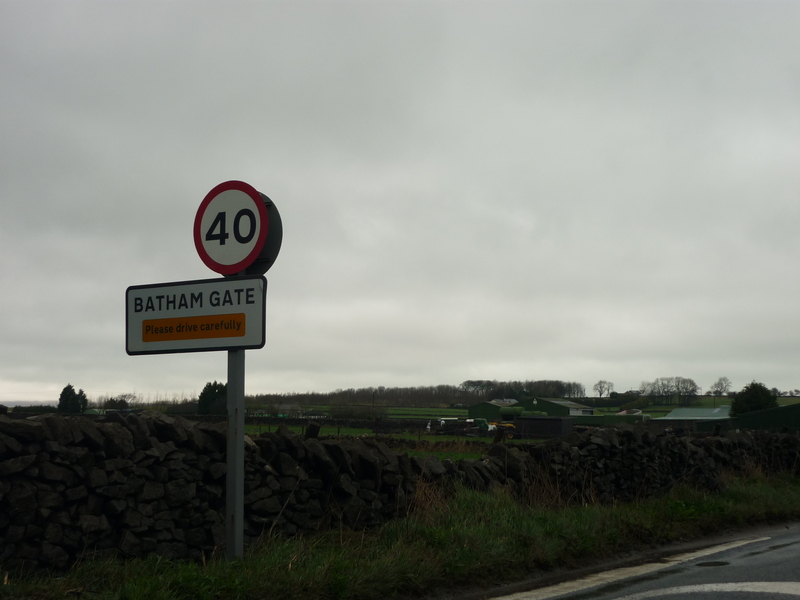 1911 Census: Living @ Batham Gate aged 20yrs. Occupation Lime Burner. Grave Plot: Longuenesse Plot 1V. F. 60. 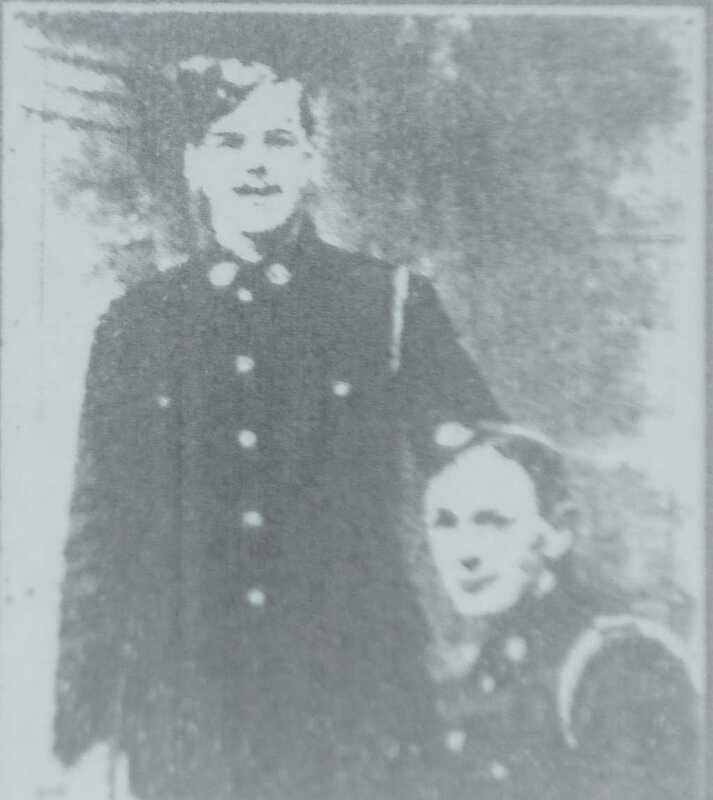 Harry pictured (left) with his friend Frank Butler who also lost his life during the War, photograph from Buxton Advertiser. 1900: Harry started North Road School on 26th June 1900, already at school was his older sister Lillian (Lillie) born 26th February 1891 who started school on 8th June 1896. Harry also had 2 older brothers John Thomas born 1st October 1872 started school 31st March 1879, Frederick born 16th November 1886 started school 29th April 1895, as well as Lillie there were 2 other sisters Bertha born 5th August 1876 & May born 30th May 1881, Bertha & May started school on the same day, 10th September 1889. 1911 Census: Living at 35 Windsor Road, Fairfield (living with Mum & Brothers & Sisters) aged 16yrs, his occupation was a Fruiterer’s Assistant. 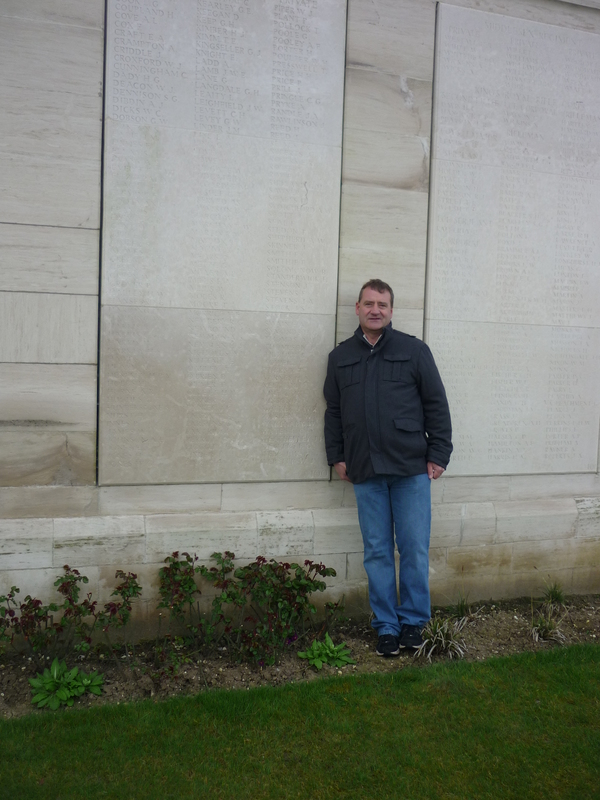 Loos Memorial 2014 (Panel 99-101). 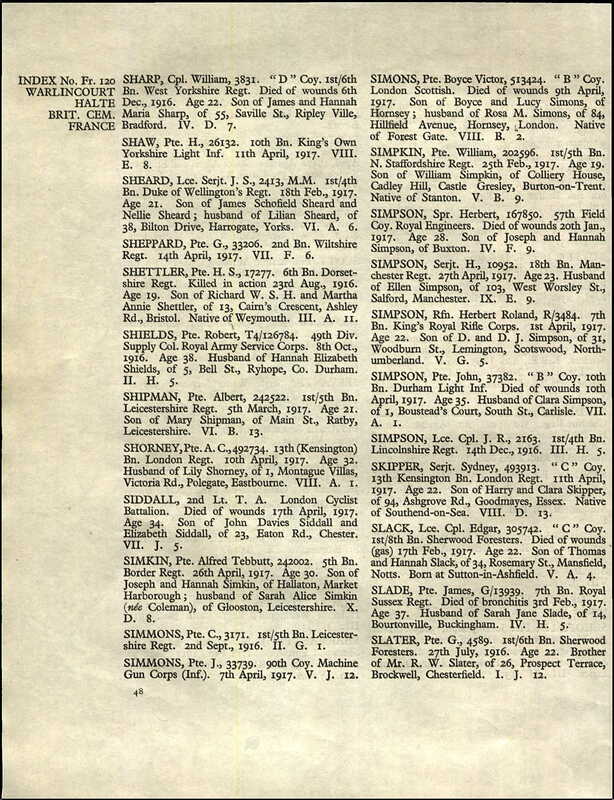 Official news has been received from the War Office of the death of, Corporal Harry Sellors, of Fairfield. Before the statement arrived Lance-Corporal T Elliott conveyed the news to Mrs Sellors, in the following letter :- “It is with my deepest sympathy that I inform you of the death of Harry, which took place last Friday (3rd inst). He was shot through the head by a German sniper. I know what a terrible blow it will be to you & the girls, for he was a good lad, and thought alot of his home. It is only a few weeks since he joined us, but we have spent many happy hours together, hours I shall never forget. 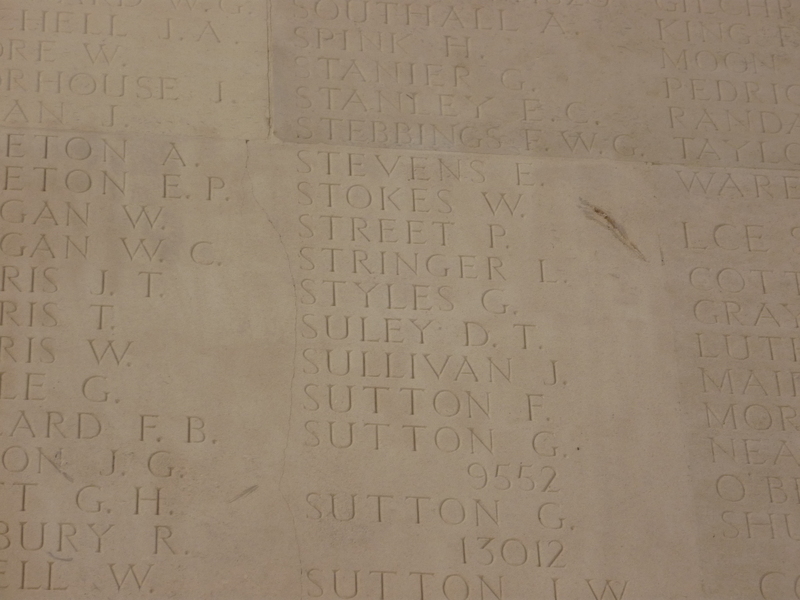 When we came to France there were five Buxton boys in our Battalion; two have given their lives for their country, and the other two are wounded. Then came Arthur Phillips, but I hope to see Arthur again before long: he has gone into hospital, but should be well again soon….. May God comfort you and all the family in your bitter loss. 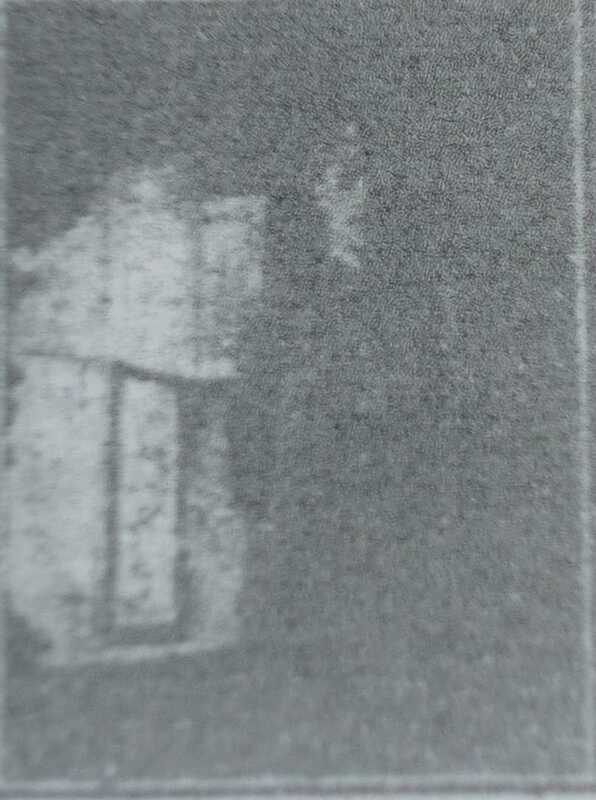 The deceased was the son of Mrs Sellors, Windsor Road and would he have lived, have celebrated his 21st birthday on the 20th inst. He attended Fairfield Wesleyan Chapel and was employed by Mr J H Dale and had a very promising career before him. He has two other brothers serving, and of the three he was the youngest. He was first wounded at Loos, in the head by shrapnel, and was home on sick leave at Christmas. 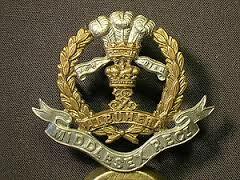 He joined the Middlesex Regiment in 1914. The family have the deepest sympathy of all in their irreparable loss. 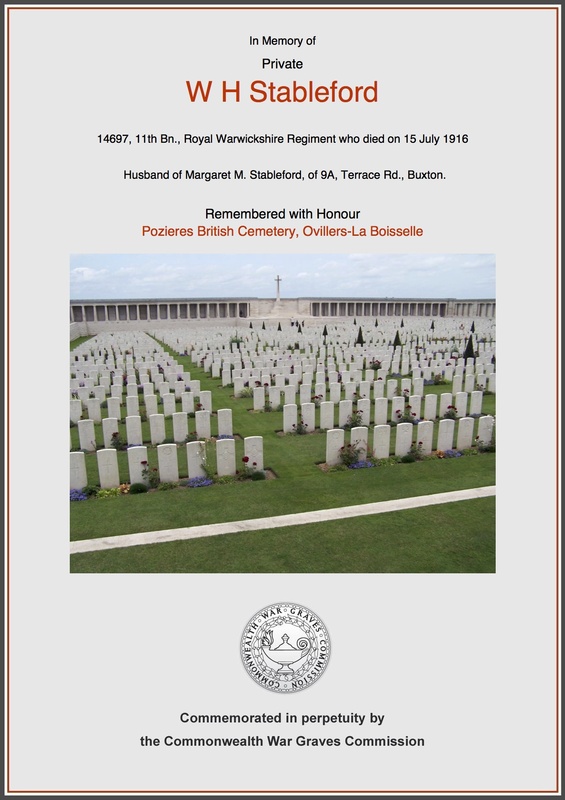 Harry is remembered on same Memorial Panel 99-101 @ Dud Corner, Loos as Pte John Stenson G/6417 & Pte John Rawlinson G/5806 both from Fairfield, Pte Harold Orgill from Fairfield also remembered at the same memorial. 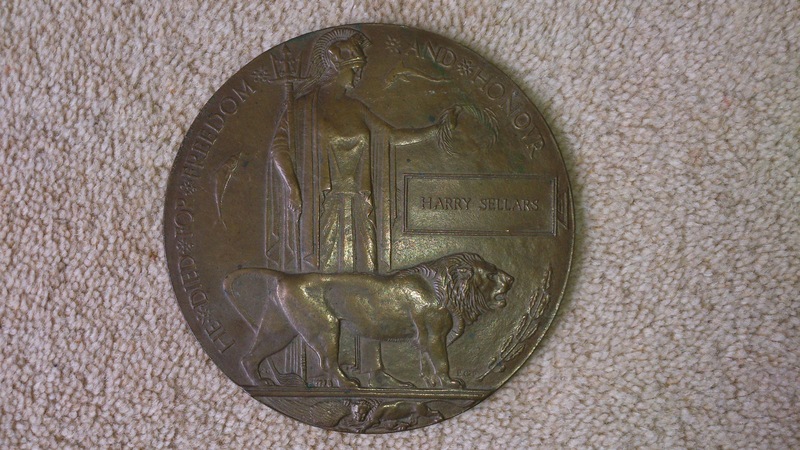 Harry’s older brothers both served during WW1, John T Sellers was Sapper 160540 in the Royal Engineers, Frederick Sellers was Pte 198057 and served with the Labour Corps.